I'm reading through three lists of best horror with two friends, posting reviews as we go. (For more information, including a list of the books, see this post.) So far, I've reviewed Poppy Z. Brite's Drawing Blood and Robert McCammon's The Wolf's Hour. 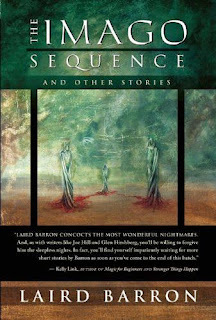 This week, I'm reviewing Laird Barron's The Imago Sequence. His stories didn't lay out the monsters for the reader most of the time. In fact, some of them left me thinking long after I'd finished reading them, just to process what I'd read and how it had ended. For the most part I liked this, though at least one left me scratching my head instead of intrigued. One of my favorite stories was so beautifully written, yet was the one that left me puzzled about the ending. I'm pretty sure my subconscious will work it out eventually. 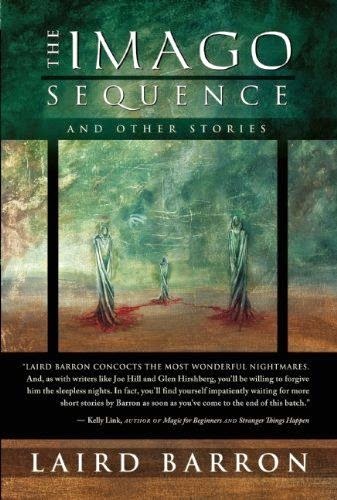 I've seen H.P Lovecraft mentioned a lot in connection with Laird Barron, and I can see why. He delves into the surreal, ancient horrors. These stories don't just focus on the age of the characters, but also on the age of evil. Inevitably, each antagonist is ancient, hearkening back to something long ago, something wild, an all-devouring force. And a force it is. No monsters, no serial killers. Forces. Something in human form may lead them to their doom, but that doom isn't so much an entity in most cases as a power. Barron's protagonists are well drawn inasmuch as we get to know a little about them as individuals, but it strikes me that this was necessary, because each character felt much the same on reflection. As I was putting my notes together, I could remember each story and each male protagonist (they were all male), but they were very similar to each other, at least in voice. The exception to this being probably that main character of Shiva Open Your Eye and the main character of The Royal Zoo is Closed. One thing I can say for his characters is that they never just lie down and wait to die. No hapless victims thrown into a story to be eaten or tormented. No, they fight their damndest to get out of whatever has befallen them. Though the characters are similar on the surface and in voice, he skillfully weaves what we need to know about them into the narrative. The same can be said about his settings, which are laid out for us nicely in most of the stories, once again weaved into it so we aren't just sitting there while he describes what everything looks like. I had a distinct image of the setting in almost every story, and he has left pictures in my head since my reading, courtesy of the strength of some of his scenes. I'm not sure how best to review a collection of short stories, so I'll break down the stories a little bit while trying to avoid spoilers. Old Virginia - An older man, crotchety and washed up, is tasked with guarding a group of scientists as they conduct some manner of experiment out in the woods. Someone's messing with them in small ways, but who is it? Rival scientists? The government? Or something darker and older? This is one of the stories where age played a major role, both with the main protagonist and the crone who is part of the experiments. We see that a man who appears washed up still has fight and intelligence in him, and learn to never underestimate anyone. Shiva Open Your Eye - This one once again features an older man who is deceptively decrepit. A contest of wits and wills ensues between him and another man. This one lost me a bit to boredom. There was so much word play, the POV character ranting on and on about his history, that my attention wandered. The words were delightfully grotesque and oddly beautiful at times, but without anything of interest being said, it just wasn't enough for me. In the end, it didn't come full circle for me. I wasn't clear on what even happened to bring the situation to a close. Procession of the Black Sloth - A man is sent out to Hong Kong (IIRC) to investigate espionage undercover. On the way there, he sees a strange sign that things aren't going to go well. Once there, an odd witchcraft seems to be afoot, and he falls more into a frightened irrationality as he tries to figure out what's going on. This was an interesting read, with a classic sort of story behind it. We plunge into confusion with the protagonist, trying to figure out along with him what's happening. The ending was a bit forgettable after the rest of the story, though. This was a story where women of advanced age were a bit of a mockery, though it was the characters doing this mocking, not to be confused with the author (maybe?). Bulldozer - I never figured out what the title referred to on this one. But I enjoyed this story. It followed a Pinkerton man in pursuit of a strongman with a stolen book (stolen from PT, himself) of some importance. The Pinkerton man is responsible for getting that book back. Set in the Wild West (my favorite era, as some of you probably know), we ride along with a man who has gotten himself in way over his head. The setting is well realized in this one, with a variety of interesting Wild West characters crossing his path. The only females in this story were ladies of the night, but I guess at least they weren't described as crones? This story is discombobulated at times (hallucinogenic? ), sending us into a mental maelstrom with the POV character. Proboscis - This was one of my favorites. The protagonist is a bounty hunter, having had to change his life. He begins seeing things, sensing something wrong, but he doesn't share it with his compatriots. The evil in this is insectile, leading him to the isolation of the Mima Mounds (also mentioned in at least one other story). The buildup is slow and steady, a taunting of the protag who gets sucked back in no matter what he tries to do to get away. As with some of his other stories, there is a bit of dissocation that occurs, a pulling back from the story and becoming confused, which serves to show us the mindset of the protag. Hallucinogenia - An older man and his child bride make an unscheduled stop, only to be sucked into something horrific that follows them home, him wounded, her with severe brain damage. He can't remember what happened, but he can sense that it's not over. He's wealthy, so he throws money at it, hiring an investigator to find out more about the place their accident occurred. But even as he delves into it, it gets closer to him. This story was excellent at showing us a great evil without actually drawing a beast to go with it. Though there's never a physical presence, it looms there, just out of sight, creeping up on him. A P.I. makes an appearance in this and one other story, making me wonder how many of Barron's stories he's been in. I did find this story too long, checking my progress to see how close I was to the end. I think the buildup could have been more quickly paced. Parallax - This was another of my favorites. A man gets a severe migraine and wakes to find his wife missing. The police think it was him, and they, as well as the press, begin hounding him. The more they hound him, the more he doubts himself. I was drawn into the story, unable to figure out what might have happened to his wife. The twist ending was interesting, and had me asking questions long after the story was done. I'd write them here, but it would give away the story. About half of what I jotted down in my notes consisted of questions I asked once it was done. The Royal Zoo is Closed - I don't remember what this one is about. Seriously. I just went and looked to see if I could find what it was about, and found nothing that clued me in. So I won't tell you what it was about, but simply tell you what I jotted down on my little bedside notepad (I do most of my reading to wind down at bedtime.) I wrote that it was beautifully written, that I had the urge to read it out loud to feel the words coming from my mouth. But it became a constant onslaught of words, a battery. And I was confused at the end, because there seemed to be no end. Maybe I should read it again. The Imago Sequence - A man becomes compelled to search out a series of paintings for a friend (who has the cash to fund it.) But his search leads him into something he didn't expect. There's something going on with these paintings, something deadly (at least to the rich.) I don't really have anything new to say about this one, because it followed the patterns of the other stories. Overall, I liked this. It was thought provoking and held powerful imagery. However, the voice of the characters was often the same and I think some of the stories traded actual story for an impression. Pacing was mostly good, but a few of them were too slow or meandering for me. And I'm not sure what to think of his female characters or his take on women. His stories were like a comfortably bumpy road, with the bumps exactly where I expected them to be. Rinse, repeat. Having said that, I feel he's a strong writer, and one that probably improved after this, seeing as how it's an earlier set of his works. I'm surprised they selected this as his best, rather than later collections or novels. But the general impression it left for me was favorable, rolling about in my head for probably awhile to come. I'll be looking into other works of his to satisfy my curiosity. Also, this is the first book that I think truly belonged on a list of horror. I didn't look at this and wonder what caused them to put it on this particular list like I did with the last two. There was a solid creep factor in many of the stories, and all were obviously horror. My next review will be of Coraline, by Neil Gaiman. Have you read Laird Barron? What did you think? Have you read this collection? Did you agree or disagree with what I've said here? I really don't read horror. I'm a bit of chicken about reading creepy stories. You made these stories sound interesting but they would probably keep me awake at night if I read them. Haven't read these. Great review! Very thorough review, one I haven't read indeed. Never got into horror so much. Susan, if you like UF-type (horror light?) The Wolf's Hour that I reviewed before wasn't something I considered horror when I read it, but was an enjoyable book. Pat, but horror is so cathartic!